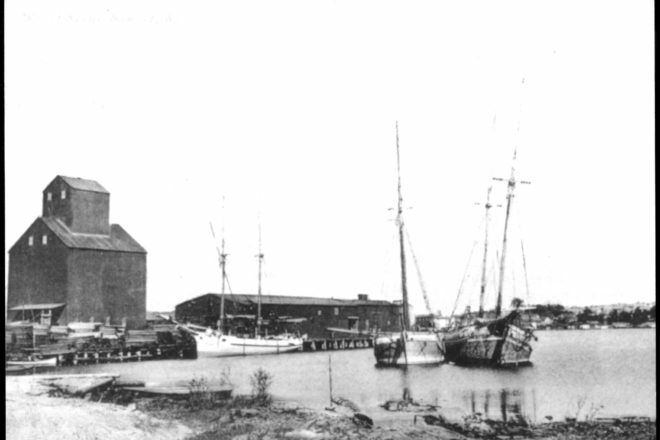 The Teweles and Brandeis Grain Elevator, at left, stood on the west waterfront of Sturgeon Bay from 1901 through March of 2018. Courtesy of the Door County Historical Museum. When the Teweles & Brandeis granary crossed the Maple-Oregon Bridge on March 29, 2018, it represented an impressive feat of engineering, and the possibility that the divisive wrangling regarding its fate might be over. But to those familiar with its history, the 118-year-old granary represented much more: its empty spaces housed echoes of a way of life that built Door County. Before dairies, cherries, shipbuilding and tourism became major moneymakers on our peninsula, farming was how most early settlers made their living. George Evenson is often referred to as Door County’s historian. He has lived all of his 90 years on his family’s farm near Sevastopol. “The money that first built this county came from agriculture,” he said. “Once farmers cleared their land of trees, they needed a cash crop that would support their families. They soon discovered that the land and climate were especially suited to growing peas. The Teweles and Brandeis Grain Elevator, the first structure north of the Michigan Street Bridge, stood on the west waterfront of Sturgeon Bay from 1901 through March of 2018. Courtesy of the Door County Historical Museum. The pea viner is a machine used to remove peas from the pod. After the peas were separated from their vines, the peas needed to be stored in a dry place until they were sold, and it was not practical in those days for each farm to have a granary. Enter Moses Teweles. Born in Prague, Bohemia, in 1832, he emigrated to the U.S. in 1854. After spending 33 years elsewhere in Wisconsin, he arrived in Sturgeon Bay in 1887 and established himself as a dealer in hides, furs, wool and rags. Within three years, he began advertising his services as a commission merchant who purchased farm products, including all kinds of grain seeds, potatoes, butter, eggs, wool and hay. By 1893, he was so successful that he added his son-in-law, Isidor Brandeis, as a business partner. Brandeis, also a native of Prague, came to the U.S. in 1877 at the age of 17. He established a mercantile business in Milwaukee and married Teweles’ daughter, Fanny, in 1888. When Brandeis joined his father-in-law, the company was called M. Teweles & Co. A year later, Moses’ son, Arthur Teweles, also joined the firm. In 1884, Sturgeon Bay businessperson A.W. Lawrence built the community’s first grain elevator next to his east-side dock and warehouse. Seventeen years later, he built a similar structure on land he owned on the west side of the bay to serve farmers in that part of the county. Like its predecessor, Lawrence’s second granary was served by a railroad spur and surrounded by water on three sides. 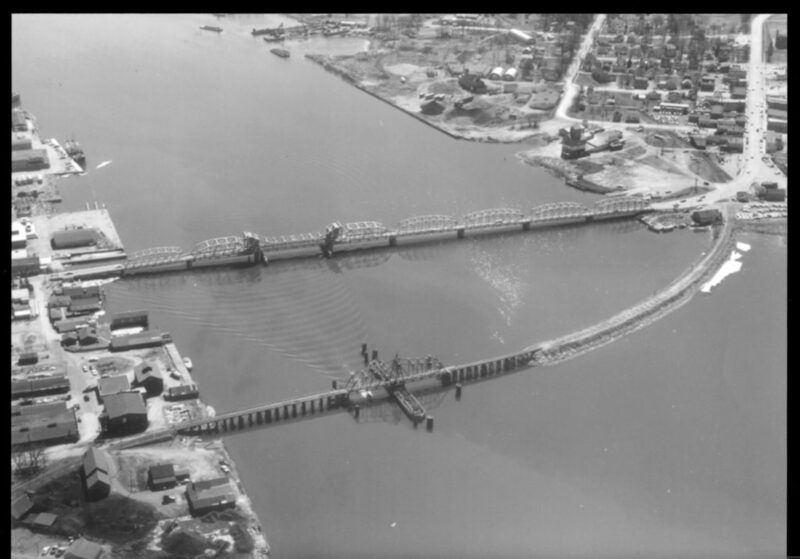 When it was completed it was sold to Teweles & Brandeis, and the building and its dock were renamed for their company. It was one of several grain elevators to operate in Sturgeon Bay and Sawyer (the second name of the city’s west side, which had earlier been called Bay View), but it was the only one to survive into the 21st century. Grain elevators are an enigma to many people today. Simply put, they stored small cereal grains in a vertical fashion. The lower floor, called the workhouse, was the heart of the granary. It contained a “boot” into which farmers dumped their grain and a vertical belt-and-bucket conveyor that lifted the grain to the headhouse or cupola, which was two to five stories tall. From there, spouts poured the grain into a series of walled bins for bulk storage. An opening at the bottom of each bin allowed the grain to empty into freight boats, trucks or railroad cars. The Teweles and Brandeis Grain Elevator, the first structure south of the Michigan Street Bridge, stood on the west waterfront of Sturgeon Bay from 1901 through March of 2018. Courtesy of the Door County Historical Museum. Like other grain elevators of that day, the 90-foot-high Teweles & Brandeis granary was built of wood and covered with metal plates that provided weatherproofing and protection from sparks that flew off the coal-powered locomotives that passed nearby. It had 19 storage bins, capable of holding a total of 30,000 bushels of grain. Beyond the original pea crop, the granary also stored wheat, rye, oats, barley, beans, clover and timothy seeds. Most of these were sold and shipped out by the company, but some were held and resold to farmers as seed to plant the next season. A 1944 fire destroyed other buildings on the Teweles & Brandeis dock, but the granary continued to serve the community after World War II. But times were changing: Large grain elevators were being constructed along railroad lines, and new federal programs encouraged farmers to build their own metal grain-storage facilities. Small-scale commercial lake shipping was also disappearing, so granaries such as the one Teweles & Brandeis operated were no longer commercially important. The firm was dissolved in 1953, and the widow of Isidor Brandeis, the former Fanny Teweles, became the granary’s sole owner. She sold it to the Door County Cooperative, which owned until 2008. In 2012 the City of Sturgeon Bay purchased the granary and surrounding property, razing all of the structures except one – the grain elevator, which was saved on the recommendation of consultants and city leaders who urged the structure be saved as an icon of the west waterfront redevelopment project. But after multiple development proposals stalled, Fire Chief Tim Dietman ordered the structure be demolished in 2017. The city moved quickly, but a last-ditch effort by a newly formed Sturgeon Bay Historical Society saved the building. In August of 2017 it was placed on the Wisconsin Register of Historic Places, and in 2018 the National Register of Historic Places added it as well. Thanks to a $1.25 million donation to support restoration, the SBHS bought the Granary in January of 2018 and in March moved it across the bridge to the east side, where it sits today. 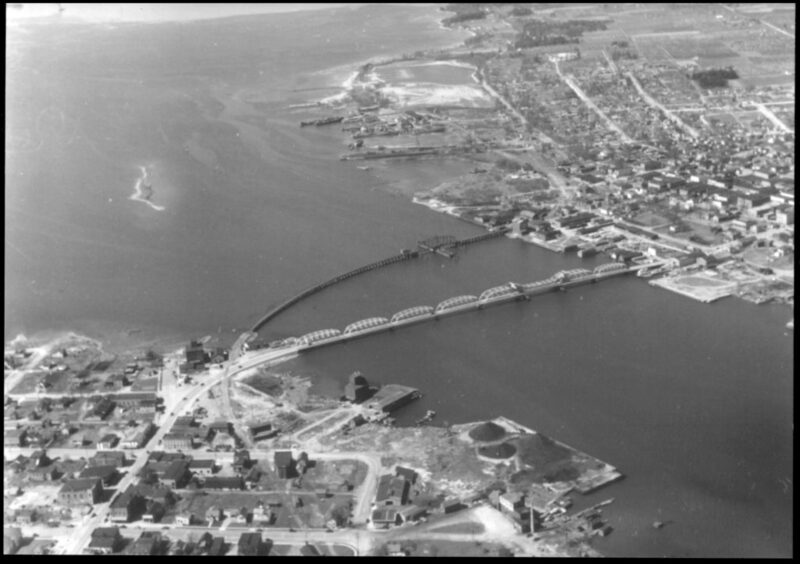 The SBHS has committed to restoring it for use as a public space in accordance with an agreement approved by the Sturgeon Bay Common Council March 19. What that looks like remains to be seen as the city’s ad hoc West Waterfront Planning Committee explores possibilities for the area. Much of the data in this story came from the nomination packet seeking the granary’s placement on the Wisconsin and National Registers of Historic Places, prepared by Timothy Heggland, a historic-preservation professional.